Although Gold and Silver are the most famous precious metals, Platinum Coins have quickly found favour with discerning investors and collectors. Platinum lacks the history of gold or silver as a coinage metal but platinum bullion coins have proven popular since the 1970s thanks to the metal’s greater rarity. Platinum is an important industrial commodity and it’s in high demand among collectors and investors. Traditionally, platinum has traded at a similar or greater premium than gold. Since around 80% of the world’s platinum comes from South Africa where disruptions in the mining industry can affect price and supply, platinum bullions are an increasingly attractive option. All Coins need to have a millesimal fineness of .9995 to be considered pure platinum. Why should I buy Platinum Coins? The Platinum American Eagle - unlike Gold and Silver Eagles, the Platinum Eagle has an annually changing reverse design and is only available as a 1 oz coin. The ‘Vistas of Liberty’ designs were launched in 2009 and show the Statue of Liberty gazing towards the future. The Canadian Platinum Maple Leaf - one of the world’s most famous Bullion Coins, the Platinum Eagle had the same iconic design features as its Gold and Silver counterparts. The Platinum Maple Leaf was produced in a range of sizes between 1998 and 2002, and coins from these years are very much in demand. 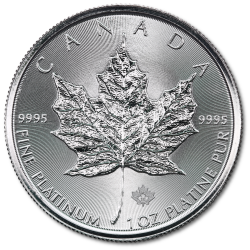 In 2009, the Royal Canadian Mint re-introduced the 1 oz Platinum Maple Leaf Bullion Coin. Platinum Commemorative Coins have been issued since 1978 and some of the best known include the Platinum Canadian Maple Leaf, the Platinum China Panda, the Platinum American Eagle, the Isle of Man Noble and the Platinum Koala from the Perth Mint in Australia.